Once, there were three apples hanging on a tree. A farmer came by and picked the first apple and sent it to a farmer’s market. A mother stopped by, purchased the small apple and gave it to her son for lunch. He ate the apple in three minutes and consumed 50 calories, 2.5 grams of fiber and a sprinkling of 7 minerals and 10 vitamins.Then the farmer returned and picked the second apple and sent it to the applesauce factory. The core, stem and skin were removed and then mashed with other apples. A few ingredients such as salt and sugar were added and the sauce was placed in a container with a silver lid. It was shipped to the local supermarket and a mother purchased it and added it to her daughter’s lunch. Her daughter ate the apple sauce (1/2 cup) in two minutes and consumed 100 calories, 1.5 grams of fiber and a small sprinkling of 7 minerals and 8 vitamins with additional sodium. Lastly, the farmer picked the third apple and it was sent to the apple juice factory. The machines extracted all of its juice and placed it in a juice box with the juice of other apples. One morning a mother stops at the local corner store and grabs the apple juice box to include in her son’s lunch. After he eats his lunch, her son drank the juice (8.45 oz.) and in less than one minute consumed 120 calories, less than 1 gram of fiber and a tiny sprinkling of 7 vitamins and 7 minerals. I hope that all three children live happily ever after without suffering from chronic diseases but here are three points we can learn when we choose between these three foods. ● First, the whole apple delivers more fiber. Fiber is associated with slowing down the uptake of sugar into the bloodstream and helping the body get rid of waste materials in a timely manner. ● Second, the apple delivers fewer calories. 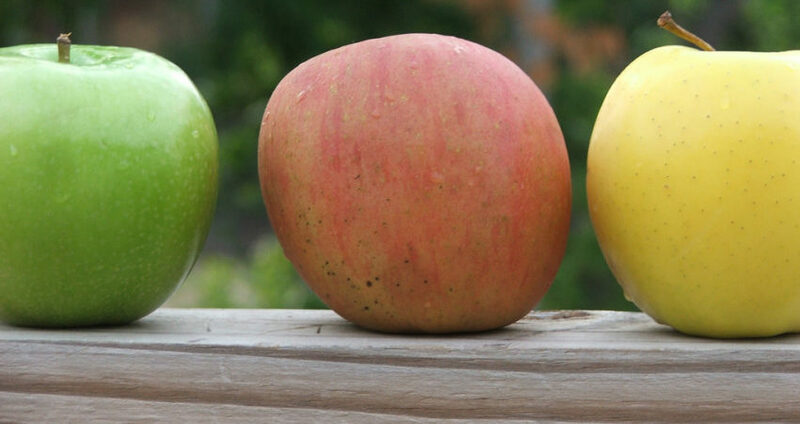 With the dramatic increase of obesity among children, choosing the apple over the other two apple products can help keep the calorie intake low. The calorie intake doubles with the applesauce and more than doubles with the juice. ● Finally, the appetite will feel more satisfied when taking time to eat 50 calories in three minutes rather than gulping down 120 calories in less than a minute. In addition, the fiber can also help us feel satisfied when compared to the juice. So what’s the bottom line? Choose the whole apple more often and the applesauce and juice less often to help support good health. Reference: USDA National Nutrient Database for Standard Reference. – http://ndb.nal.usda.gov/. Accessed November 25, 2012.